The key principle of Office Solutions is a comprehensive approach to cooperation with our clients. We offer a full range of services to help create the best possible working environment: from design concept to office fit-out, relocation management, and the follow-up maintenance. We have over 20 years of experience in the Russian market. The company was founded in 1995 and is one of the pioneers of the office interior design market. We have earned the trust of over 600 clients, including some of the world’s leading brands. On average, our team completes about 500 projects a year. All our services (engineering, planning and installation) is done in house. We carry out projects of varied scope and complexity level. Some of the projects we took part in have been recognized by the professional community and won prizes at «the Best Office Awards». Established partnership with global business leaders and Russian companies. 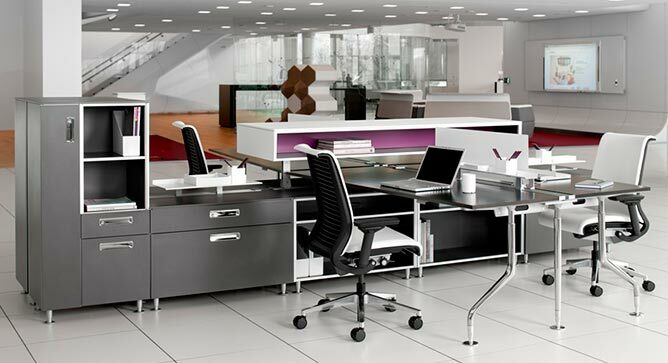 Steelcase— worldwide market leader in office furniture. In cooperation with Steelcase — consulting, working environment concept development based on the experience and methods of ARC, USA (Steelcase Applied Research & Consulting). Lafano – space devision solutions, producer of premium segment office partitions, design and engineering. Interface Flore – global leader in the office carpet tile market. We have partnerships with over 40 manufacturing companies from different pricing segments, enabling us to find the best solution to our client’s needs. We have vast accumulated experience and resources to the optimum contribute to customized solution development. We have our own showrooms in every country where Office Solutions operates.